Welcome! Mountain Paradise Found is an interactive guide to North Carolina's Great Smoky and Blue Ridge Mountains. Our mountains offer unparalleled beauty, scenic drives, enchanting waterfalls, wildflowers, and mountain trails. Here you may just relax and listen to the quiet, or enjoy a variety of outdoor adventures: whitewater rafting, mountain biking, hiking, horseback riding, golf, zip-lining, etc. Discover small town hospitality and quaint shops, featuring hand-made items, crafts and antiques. Dining choices are eclectic, from small cafes to gourmet dining. Clicking on map text, e.g. "Great Smoky Mountains National Park," opens a link to that web site. Click on any of the four green corner borders to enlarge that quadrant of the map that has the adventures/attractions/sites you are interested in. Enlarged Quadrant Maps have suggested day trips, which when clicked open a window with driving directions and links to detailed information. Clicking on the following gets you directions to all waterfalls, all hiking trails, all breathtaking vistas or all multiple use trails. To view all directions at one time please view the complete listing file. For viewers with high resolution screens (1280x1024 or above) you can view the entire map with clickable destinations by entering the whole map page. 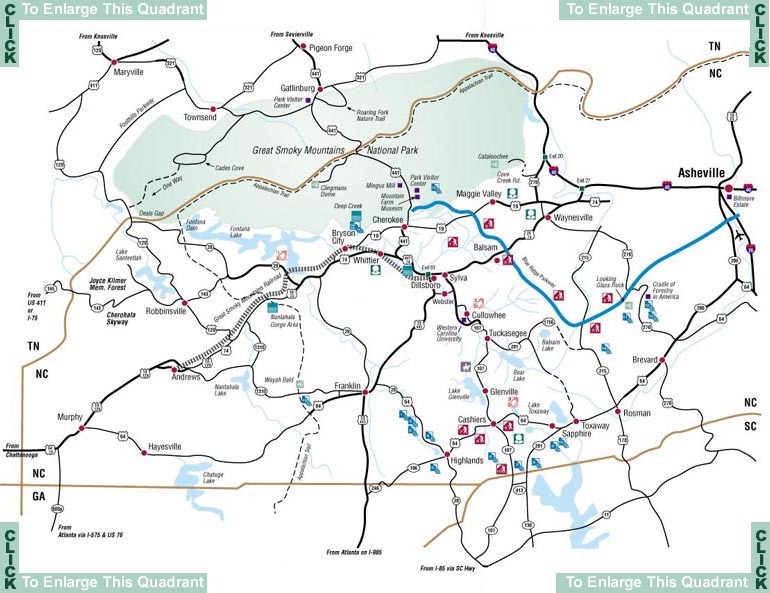 On the Enlarged Quadrant Maps, clicking on icons or names opens pop-up windows with directions to waterfalls, hiking trails, breathtaking vistas, multiple use trails or links to area attractions. This site is continually being updated, so if you click on a name on an Enlarged Quadrant Map and no link appears, try again later. Clicking on Foliage Report lets you view the current status of the Fall Leaf Color changes. This interactive guide is brought to you courtesy of The Chalet Inn. If you have information on an attraction in the area you think should be included, or a link that should be added or find a "broken" link, please Email us at paradisefound@chaletinn.com. Mountain Paradise Found Logo, The Chalet Inn Logo, maps, photos and original text are Copyright � 2000-16 by The Chalet Inn, Inc. All Rights Reserved and except for personal use may not be used or reproduced without the express written consent of The Chalet Inn, Inc. Logos and "Mountain Paradise Found" are Trademarks� of The Chalet Inn. All HTML Coding Copyright � by The Chalet Inn and Deep Creek Arts. All Rights Reserved. � 2016 George Ware and Charles Snodgrass, WebMasters.